"We are modeling unfamiliar atmospheres, not just assuming that the things we see in the solar system will look the same way around another star," said Andrew Lincowski, UW doctoral student and lead author of a paper published Nov. 1 in Astrophysical Journal. "We conducted this research to show what these different types of atmospheres could look like." The team found, briefly put, that due to an extremely hot, bright early stellar phase, all seven of the star's worlds may have evolved like Venus, with any early oceans they may have had evaporating and leaving dense, uninhabitable atmospheres. However, one planet, TRAPPIST-1 e, could be an Earthlike ocean world worth further study, as previous research also has indicated. TRAPPIST-1, 39 light-years or about 235 trillion miles away, is about as small as a star can be and still be a star. A relatively cool "M dwarf" star—the most common type in the universe—it has about 9 percent the mass of the sun and about 12 percent its radius. TRAPPIST-1 has a radius only a little bigger than the planet Jupiter, though it is much greater in mass. 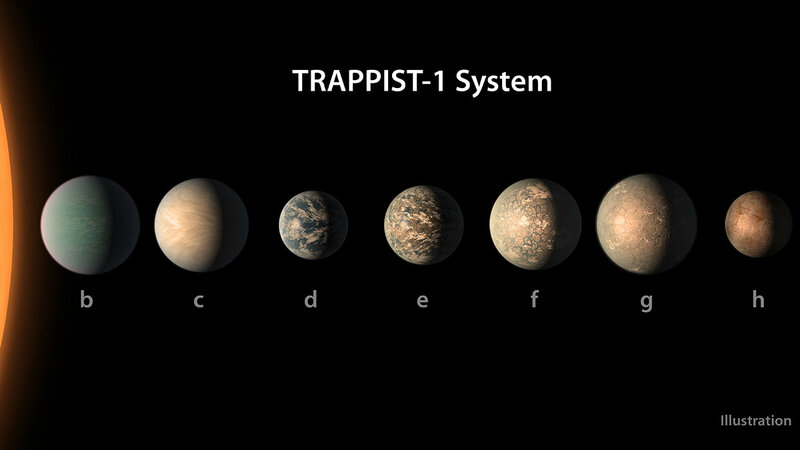 All seven of TRAPPIST-1's planets are about the size of Earth and three of them—planets labeled e, f and g—are believed to be in its habitable zone, that swath of space around a star where a rocky planet could have liquid water on its surface, thus giving life a chance. TRAPPIST-1 d rides the inner edge of the habitable zone, while farther out, TRAPPIST-1 h, orbits just past that zone's outer edge. "This is a whole sequence of planets that can give us insight into the evolution of planets, in particular around a star that's very different from ours, with different light coming off of it," said Lincowski. "It's just a gold mine." Previous papers have modeled TRAPPIST-1 worlds, Lincowski said, but he and this research team "tried to do the most rigorous physical modeling that we could in terms of radiation and chemistry—trying to get the physics and chemistry as right as possible." The team's radiation and chemistry models create spectral, or wavelength, signatures for each possible atmospheric gas, enabling observers to better predict where to look for such gases in exoplanet atmospheres. Lincowski said when traces of gases are actually detected by the Webb telescope, or others, some day, "astronomers will use the observed bumps and wiggles in the spectra to infer which gases are present—and compare that to work like ours to say something about the planet's composition, environment and perhaps its evolutionary history." He said people are used to thinking about the habitability of a planet around stars similar to the sun. "But M dwarf stars are very different, so you really have to think about the chemical effects on the atmosphere(s) and how that chemistry affects the climate." 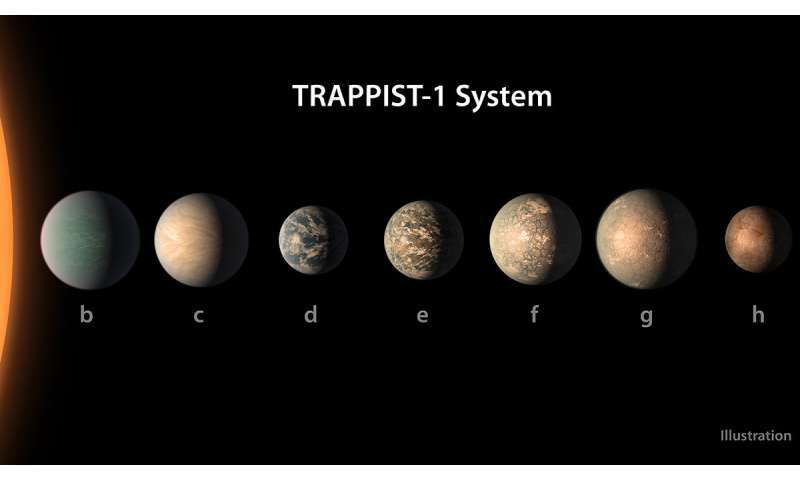 Combining terrestrial climate modeling with photochemistry models, the researchers simulated environmental states for each of TRAPPIST-1's worlds. Lincowski said that in actuality, any or all of TRAPPIST-1's planets could be Venus-like, with any water or oceans long burned away. He explained that when water evaporates from a planet's surface, ultraviolet light from the star breaks apart the water molecules, releasing hydrogen, which is the lightest element and can escape a planet's gravity. This could leave behind a lot of oxygen, which could remain in the atmosphere and irreversibly remove water from the planet. Such a planet may have a thick oxygen atmosphere—but not one generated by life, and different from anything yet observed. "This may be possible if these planets had more water initially than Earth, Venus or Mars," he said. "If planet TRAPPIST-1 e did not lose all of its water during this phase, today it could be a water world, completely covered by a global ocean. In this case, it could have a climate similar to Earth." Lincowski said this research was done more with an eye on climate evolution than to judge the planets' habitability. He plans future research focusing more directly on modeling water planets and their chances for life. "Before we knew of this planetary system, estimates for the detectability of atmospheres for Earth-sized planets were looking much more difficult," said co-author Jacob Lustig-Yaeger, a UW astronomy doctoral student. The star being so small, he said, will make the signatures of gases (like carbon dioxide) in the planet's atmospheres more pronounced in telescope data. "Our work informs the scientific community of what we might expect to see for the TRAPPIST-1 planets with the upcoming James Webb Space Telescope." Lincowski's other UW co-author is Victoria Meadows, professor of astronomy and director of the UW's Astrobiology Program. Meadows is also principal investigator for the NASA Astrobiology Institute's Virtual Planetary Laboratory, based at the UW. All of the authors were affiliates of that research laboratory. "The processes that shape the evolution of a terrestrial planet are critical to whether or not it can be habitable, as well as our ability to interpret possible signs of life," Meadows said. "This paper suggests that we may soon be able to search for potentially detectable signs of these processes on alien worlds."